October cleared the charts as a tough month seasoned with plenty of opportunities to lean on and praise the Lord. It’s been three years since I lost my mom to cancer. I entered the sixth year of my healing journey and am still experiencing severe muscle spasm flare-ups that lead to debilitating headaches. Physically and emotionally spent by the end of the first week of October, I considered cancelling the vacation we’d planned. By God’s grace, I was able to travel. I spent the first few days of our vacation recovering in our hotel room and could only endure short outings each day. Still, I thanked God that we were able to enjoy our time together as we continue to adjust to our “new normal.” But adjusting is a process. After returning home from our trip, I spent a few days drowning in discouragement. Though people meant well, those phrases reminded me how weak I felt. My depleting strength made it impossible to believe I’d be capable of doing anything, staying encouraged, hanging on to Jesus, or holding on to my smaller-than-a-mustard-seed faith. Some days, all I could do was simply rest in God’s presence. On the good days, I’d read my Bible between unplanned naps or bouts with chronic pain. I’d let worship music pour over me and let my sighs . . . and sometimes my tears . . . be the prayers I placed at God’s feet. I couldn’t depend on my own strength. I didn’t have all the answers I needed. Self-help failed me every time. As always, the Lord comforted me and strengthened me as He carried me through the prickly patches of adversity. When I couldn’t cling to hope, when I couldn’t imagine pressing on or persevering, God never failed me, never disappointed me, and never let me go. God held me close and embraced me with His endless supply of grace. 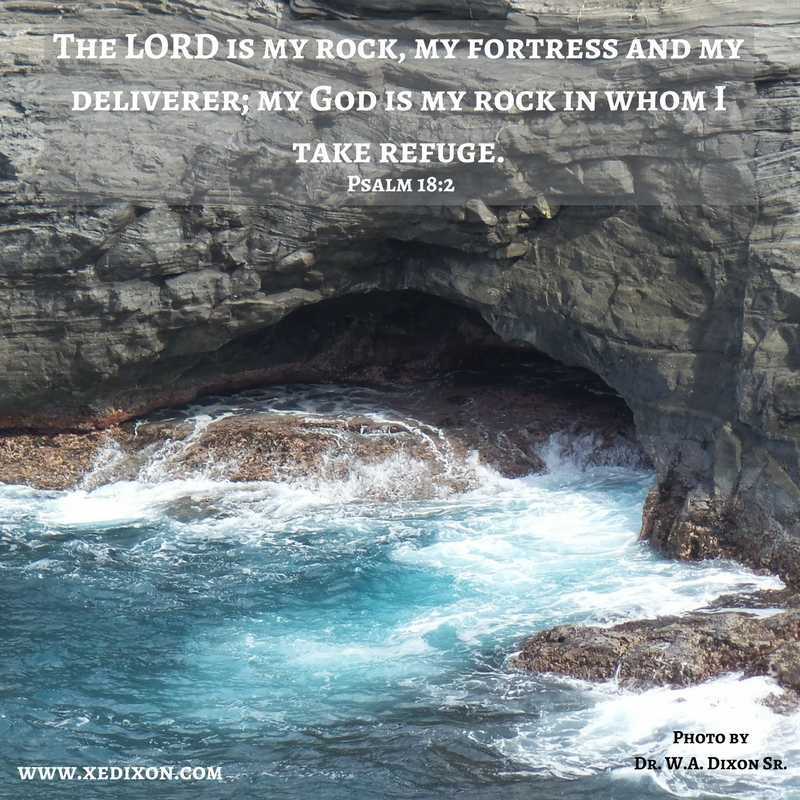 Like the psalmist David, I’ve learned that the Lord doesn’t just give me strength. God is my strength (Psalm 18:1). We can call on the One who is worthy of all our praise, no matter what we’re up against (vv. 3-6). When everything around us feels like it’s falling apart, when it seems as if we’re losing our grip, we can trust God to rise up in majesty and fight for us (vv.7-15). God reaches down to take hold of us, to pull us out of the depths of discouragement, despair, depression (v. 16). When we feel outnumbered, outmuscled, or out of chances, the Lord turns our eyes toward His promises and rescues us . . . often first from ourselves (v. 17). Many of our fiercest foes and our toughest critics face us in the mirror each day. But whether we’re battling the lies we tell ourselves or our circumstances are jabbing us until we fall to our knees, the Lord will support us (v. 18). As we draw nearer to Him daily in prayer and seek to know Him intimately through Scripture, God confirms His love for us remains unconditional, unmatched, and unending (v. 19). We may not be able to see the light at the end of our current tunnel of adversities. We may not be able to feel the ease of relief today. But we can trust God hears us, cares for us, and will always be there for us. Almighty Lord of Lords, thanks for reminding us that we can cry out to You in prayer and stop trying to flex our muscles to prove we’re strong enough to hold on. Please help us trust You will never let us go. In Jesus’s name, Amen. Photo taken by and used with permission from my husband, Dr. W.A. Dixon, Sr. This entry was posted in Encouragement and tagged Encouragement, Healing Journey, Trusting God by Xochi E. Dixon. Bookmark the permalink. Thank you for your encouraging words. They also helps us to know better how to lift up a person who suffers with chronic pain and not just an occasional headache. Thank you for that too. Colleen, I appreciate your heart. Thanks for always looking for ways to serve others. You are such a blessing in my life Sister. Incredible promises in God’s Word. Awesome power at our fingertips. And when we feel hopeless, at the end of ourselves, it does feel like we’re hanging by our fingertips. Thank you for sharing about your adversity so we can be encouraged and forward this to others who need a sweet reminder of our faithful Most High God. Karen, you are so right! God’s Word offers us all the hope we need. I appreciate your loving support and your kind words, Sister. And thanks for using your gifts to encourage others to place their hope in Christ. To God be the glory! I ask God every day to stop all your pain, but He seems to think He knows better than I do about how to run the Universe. Maybe the pain is your refining fire. You are certainly a profound thinker and inspiring writer. Thanks for your kind words of encouragement and your faithfulness in prayer, Janet. You are one of the most loving people I know. Thanks for being a wonderful support, Sister. I love you! Learning to rest has been my hardest lesson in this walk. Resting is not admired but the world, or lauded, or understand – pushing through is. But… Jesus rested. God rested. They are our barometer, not the world. And in our quiet moments, with God holding us close, and our pillow ❤️, we have time and moments of beauty with the Father where he can whisper sweet encouraging words into our spirit. You are so right, April. Resting isn’t as easy as it sounds. I’ve had a hard time accepting those days when I’m worn out after doing nothing but resting. I’m praying God will continue to be my peace as I adjust and accept this season as an opportunity to deepen my trust in Him. Thanks for being a beautiful example of hope and grace. I love you, Sister. Thank you for those encouraging reminders from Psalm 18. Many times recently the Holy Spirit has spoken to me through your words. The last few months have been a series of hills and valleys. I too, am listening to worship music and the lyrics are also my prayers to our healing, loving, merciful, gracious Lord and Savior. Through everything God is my Rock, my Fortress, my Strong Tower. Praise be to our loving Lord and Savior! Thanks for sharing your story and your words of encouragement, Pamela. I’m so sorry the last few months have been difficult. I pray God will continue to empower us to trust Him as He holds us in His mighty and merciful hands. You are loved and not alone, Sister.